If you are like me, you can’t resist a fresh cup of grapefruit juice or a luscious grapefruit in the morning. I personally like to cut mine in half and dig out the juicy wedges with a spoon. Yum! The grapefruit and its fresh juice are not only delicious, but incredibly health-promoting. Both are packed with Vitamin C, Vitamin A (pink grapefruit juice, not white), dietary fiber and potassium..all good things. Unfortunately, although I hate to be a Debbie Downer, there is a down side as well. Waaaa waaaaaaaaaa. Grapefruit juice has the potential to interact with many medications, at times in a dangerous manner. Therefore, if you or your loved ones are grapefruit lovers like myself, this is important to be aware of when taking certain classes of medications. We are not entirely sure of the culprit ingredient within grapefruit that is responsible for the interaction but the top candidate is furanicoumarin also found in tangelos and Seville oranges. The responsible chemical binds to an enzyme, CYP3A4, in the intestine. By interfering with the enzyme, ingestion of grapefruit juice can lead to decreased metabolism or breakdown of certain medications. As a result, the amount of medicine absorbed by the body is increased and the abnormally elevated levels can be dangerous. 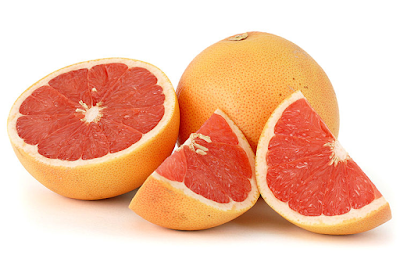 Just one glass of grapefruit juice can lead to an almost 50% decrease in the enzyme responsible for absorption! Therefore, it is important to be aware if you regularly consume grapefruit products and take any of the medications with which they interact. Depending on which medication and the dose, you may need to forgo grapefruit juice altogether or you may be able to get away with infrequent consumption. Ask your doctor how vigilant you need to be. That being said, my advice is no matter what, avoid taking your meds with grapefruit juice simultaneously. The following is a list of some common medications that can have serious interactions with grapefruit juice. This is by no means a complete list. There are many more medications that have either substantial or little interaction that are not listed here. If you have any questions about the specific medications you are taking, check with your health care provider. One final point about Viagra (Sildanefil) which many men take for erectile dysfunction. Consumption of grapefruit juice can lead to elevated levels of the drug in the bloodstream which may be initially perceived as a positive. However, this drug level boost can also make side effects such as flushing, headaches and low blood pressure more likely. It is best to avoid this combination.